engaged by 24 volts or 110 volts d. C. (others on request). released by spring pressure (in special cases also vice versa). Jayson's TC Series tooth clutches are available in air actuated & spring released and also spring engaged & air released models and have the following characteristics. Shree Engineers is a trusted name in the global industry for the Manufacturer, Trader, Supplier, Exporter & Service Provider of the Electromagnetic clutches and brakes. S.K.ENGINEERS supplies over 400 types of multi disc clutches and brakes operating on 12VDC , 24VDC, 90 VDC. The torque carrying capacity of these products is ranging from 0.5 kgm to 320 kgm. 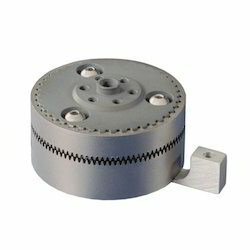 Application: These clutches provide higher torque in smaller size. usage in dry & wet running. We Offer E.M. Toothed Coupling Clutch to our clients at a market leading price as quality. These Clutches are used for Higher torque Transmission in machine tools. In a Toothed Clutch, the working of the clutch is based on the coupling of the teeth on the driving part with the correspondent teeth on the driven part. These clutches have a short release time completely free from any residual torque. Jeyson's TC Series tooth clutches are available in air actuated & spring released and also spring engaged & air released models and have the following characteristics. Torque range from 3 to 6779 Nm (20 - 60, 000 in. lbs.) . Bore Size from 13 - 100mm (0.625 to 3.938 inches) . Air engaged / spring released models. Slipring type tooth clutches can transmit higher torque compare to other multiple disc clutch of the same size. These types of clutches provide positive connection between two shafts by remote electric control. These clutches are working on 24V DC supply. Chennai Hydro Maatics Pvt. Ltd. The Toothed clutches are designed to transmit high torque in a smaller size (diameter). These clutches are to be engaged at rest or at very low speeds and are having no idling torques. These clutches operate in wet and dry conditions. Torque of these clutches are ranging from 1 kgm to 600 kgm . The Toothed clutches are designed to transmit high torque in a smaller size (diameter). These clutches are to be engaged at rest or at very low speeds and are having no idling torques. These clutches operate in wet and dry conditions. Torque of these clutches are ranging from 1 kgm to 600 kgm.